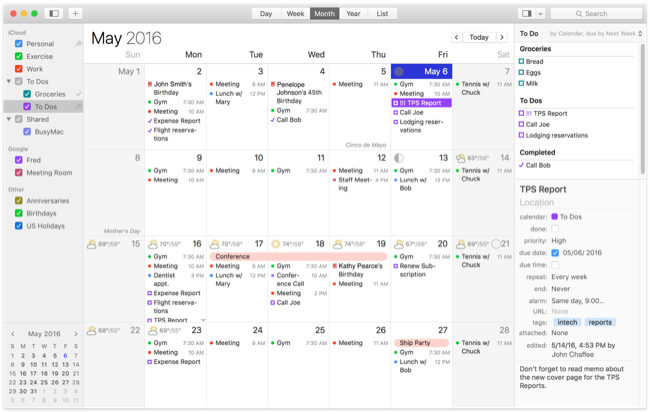 Month view displays one month of your calendar by default (with the option to redefine “month” as any period from 1–12 weeks). To scroll backward or forward one month at a time, click the left or right arrow button, or press ⌘-Left Arrow or ⌘-Right Arrow. To scroll backward or forward one week at a time, swipe upward or downward with two fingers on a trackpad, swipe upward or downward with one finger with a Magic Mouse, or press ⌘-Option-Left Arrow or ⌘-Option-Right Arrow. 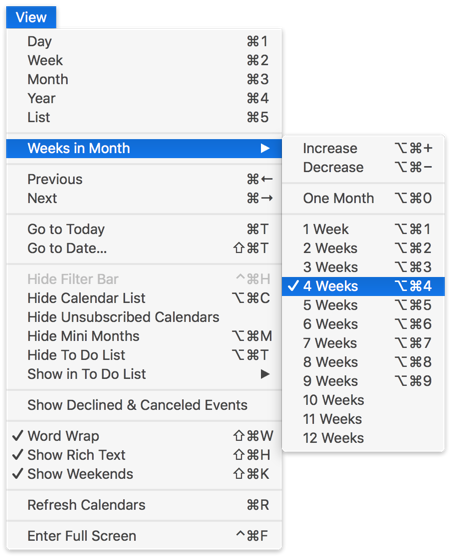 You can change Month view to show any range from 1–12 weeks by using the View > Weeks in Month submenu or by going to BusyCal > Preferences > General and choosing the desired time period from the “Month view shows” pop-up menu. You can also change various display styles in Appearance Preferences. Tip: If you display a custom number of weeks in the Month view, clicking the Today button causes the current week to appear in the top row of the Month view. Otherwise, the current week appears in its normal position in the Month view.